Turkey is aiming to stop attacks in northwestern Syrian province of Idlib, Foreign Minister Mevlüt Çavuşoğlu said on Sept. 8. Speaking to the press in the southern province of Antalya, Çavuşoğlu warned against the possibility of a "serious humanitarian tragedy" in Idlib, reminding the fact that the region is a de-escalation zone where 3.5 million people live. Çavuşoğlu said he expects clashes to end in Idlib and a political process to resolve the issue, adding Turkey is making efforts with Russia and Iran. Seized from government forces in 2015, Idlib and adjacent areas form the final major chunk of Syrian territory still under opposition control. It is home to some three million people -- around half of them displaced from other parts of the country, according to the United Nations. Damascus, which has retaken a succession of rebel bastions this year, has set its sights on Idlib, which is held by a complex array of rebels and jihadists. But a major military operation is expected to pose a humanitarian nightmare because there is no nearby opposition territory left in Syria where people could be evacuated. Çavuşoğlu added that he talked about the issue with his German counterpart Heiko Maas. "A refugee influx will affect both us and Europe," he said. In an interview for German newspaper Frankfurter Allgemeine Zeitung, Maas said "intense diplomatic efforts continue to prevent a big disaster in Idlib." German foreign minister also described his recent visit to Ankara as "a beginning to normalize Turkey's relations with the EU." Meanwhile, Turkey's Nationalist Movement Party (MHP) leader Devlet Bahçeli accused Syrian President Bashar al-Assad and Russian President Vladimir Putin of "sabotaging efforts to declare ceasefire." Bahçeli also said in a series of tweets on Sept. 8 that "Assad should not be in Syria's future," while calling for "planned and urgent repatriation of Syrians in Turkey." Turkey's main opposition Republican People's Party (CHP) deputy chairman Ünal Çeviköz called for rapprochement with the Syrian regime and more dialogue with the United States and the European Union on the Idlib issue. "An active diplomacy is needed to neutralize the threat," he said in a statement on Sept. 8. Çeviköz also urged Ankara to call on Syrian opposition groups to lay down arms while working for the safe evacuation of civilians from Idlib. Russian air strikes against the rebel bastion have reached their "most violent" in a month, according to a monitor. Five civilians were killed and seven others injured in airstrikes carried out by Syrian regime forces and Russian warplanes in Idlib on Sept. 8, according to the White Helmets. At least 26 civilians have been killed and dozens injured in airstrikes and attacks by regime forces and Russian warplanes in Idlib and Hama since the beginning of this month, the group said. 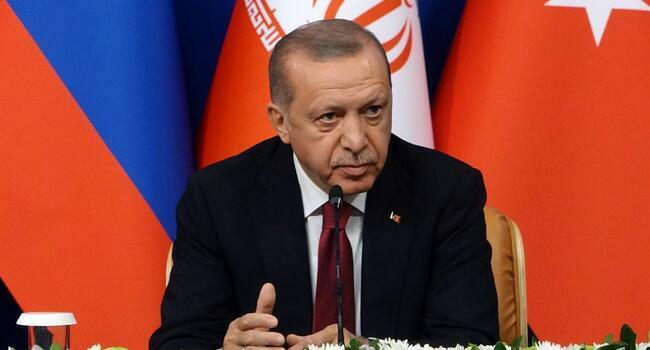 A trilateral summit of the presidents of Turkey, Russia and Iran on Sept. 7 underlined that “there could be no military solution to the Syrian conflict" and called for advancing the political process to reach a negotiated solution.